The UK Border Agency has temporarily suspended student visa applications from northern India, Nepal and Bangladesh after a jump in numbers. In the last three months of last year, there were 13,500 applications from northern India alone, compared with 1,800 in the same period of 2008. British officials say the system has been overwhelmed and there are concerns that many cases are not genuine. Unscrupulous offers of visas as a way of settling in the UK are not uncommon. The British high commissioner in Delhi, Sir Richard Stagg, said abuse of the system would not be allowed to happen. 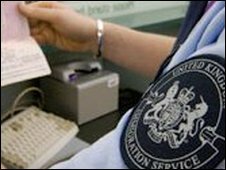 While extra checks take place, visa applications have been temporarily suspended - a decision which will be reviewed at the end of February. Jeremy Oppenheim, of the UK Border Agency, said: "The points-based system gives us the flexibility to act to maintain the integrity of the visa system, whilst processing legitimate applications fairly, thoroughly and as quickly as possible. "We continually check and monitor all student applications and education providers to ensure that they meet the required standards. "We will take tough action against those who attempt to abuse the system." The director of the legal advice firm, London Immigration Advice and Appeal Services, Harjap Singh Bhangal, says a temporary suspension will prevent illegal immigration, but it will also adversely affect genuine students. He told the BBC: "It's going to create a panic and we don't know when this suspension is going to be lifted. I believe it's for one month initially but it could run into several months. "The problem that we're going to have is that the genuine students who want to come over for the universities they're going to suffer as a result and they won't be able to get here in time for their courses." India is currently the UK's biggest visa operation in the world. More than 500,000 Indians visit the UK every year, among them tens of thousands of students.